Are you looking for the best charter bus rental Orlando service that offers you competent and affordable luxury transportation in the city? Do you want to enjoy the best 20 passenger mini bus airport transportation service when you land as a group to attend a birthday event in the city? You might need a charter bus for various types of transportation needs. Hire a charter bus now call 813-514-6980! We are there to provide you the best charter bus you want to make your transportation to and from events memorable. Whatever be your bus size needs, be it 30 passenger shuttle bus or 50 passenger charter bus, you will find every kind of vehicle in our fleet. Our fleets offer the latest amenities like full HD TV, audio system with surround speakers, disco lighting, well trained and experienced chauffeurs, leather seats, attractive interiors, etc. We ensure you that our charter bus rental services will reach you to your destination always on time. Booking our 40 passenger charter bus for an event is very easy. Visit our website and give information like pick up and drop destinations, pick up date, number of passengers, etc., in our online quote form. You will receive a quote on your phone or email as quickly as possible. You will never need to look for any other bus charter service as we offer the lowest quotes with online booking discount offers as well. Orlando party bus rentals are also available for people that want to show their guests a good time! We have a wide variety of fleet to suit your taste and budget. 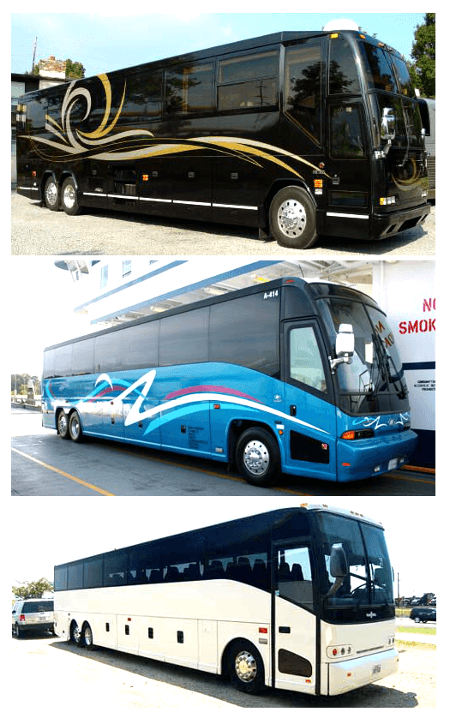 We also offer charter buses in two to three different colors to suit the occasion. We maintain high safety and security standards always and your trip on our buses will be smooth and hassle free. Let us answer any questions you may have, call 813-514-6980. Universal Orlando; a movie theme park with resort for all movie buffs. It is a fun place for the entire family. Disney’s Animal Kingdom; a theme park to find exotic animals and thrilling adventures. Universal Citywalk; hire charter bus Orlando to visit this great place to hang out at nights. Enjoy sumptuous food, great drinks and karaoke music. Mall at Millenia; this is a shopper’s paradise and one of the best malls in Florida. Discovery Cove; get to swim with a dolphin or exotic fishes in this tropical getaway. Hire the best airport transfer service to pick up from the airport and drop you at your destination or vice versa. We specialize in airport transportation and picking and dropping you at Orlando international airport or Orlando Sanford International airport is always done on time. Try our limousine rentals in Orlando for airport transportation. We offer affordable charter bus rental services to and from nearby towns and cities. Traveling in a large group will be very affordable when you hire charter bus Orlando. Some of the nearby cities we cover are: Tampa, Saint Petersburg, Pine Hills, Forest City, Casselberry, Fern Park, Oak Ridge, Conway, Doctor Phillips and Azalea Park.